Glock’s Zaranza pricks his ears and pulls on the reins as he hones in on a jump. The dark bay gelding clears the grand prix fences in fluid fashion when Dutch Olympic medalist Gerco Schröder guides him around international grand prix tracks. But 2 ½ years ago, whether he would finish a round without a fault wasn’t the biggest question facing “Zaranza.” Instead, his team waited anxiously to learn whether he would survive the night. 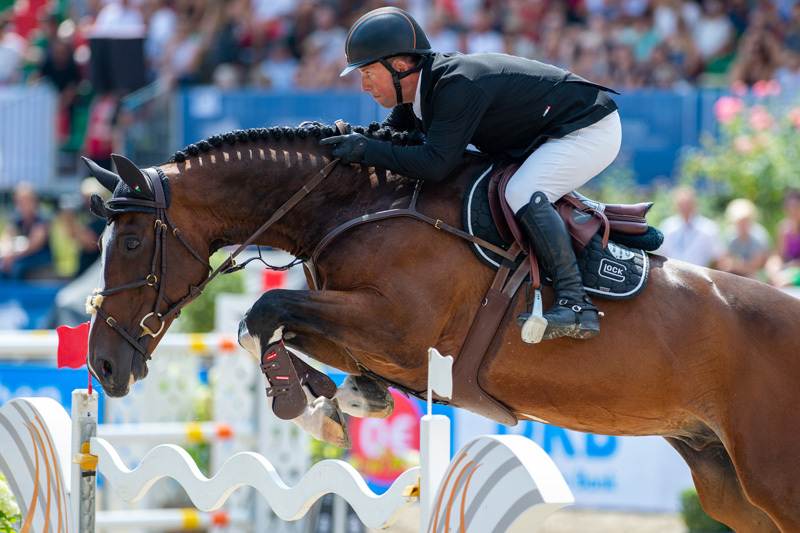 The Dutch Warmblood (Karandasj—Santa Caterina, Heartbreaker) started jumping in Fédération Equestre Internationale classes with Austria’s Robert Puck in 2012. He campaigned him in a handful of CSI5* classes before owner Gaston Glock gave Schröder the ride in November 2014. The pair quickly found their rhythm, picking up good ribbons and globetrotting in sync with the international sporting calendar. But at the end of August 2016 “Zaranza” suffered a near-fatal case of colic. 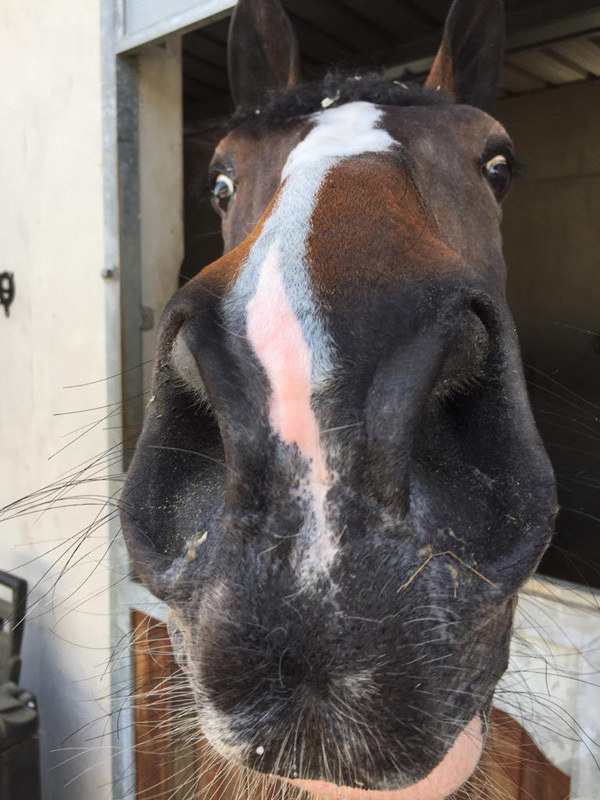 “At the beginning it was just the question of keeping him alive; no one was talking about bringing him back to the sport because it wasn’t possible,” said Schröder’s groom Alexandre Deramaudt. They took Zaranza to Tierklinik Telgte Veterinary Clinic for Horses in Telgte, Germany, where he underwent surgery to fix two meters of entrapped small intestine. “Immediately after surgery his general condition developed well, and he responded well to the treatments,” said Dr. Hilde Skowronek, Zaranza’s veterinarian. “But after 24 hours he started colicking again, and after further diagnostic examinations we decided to perform a second surgery. Veterinarians kept a close watch on Zaranza after his second surgery, monitoring his heart rate, respiratory rate and intestinal sounds every hour, as well as performing additional blood tests several times daily. “At the same time, he got infusions, antibiotics and medications that stimulate the motility of the intestines and painkillers,” said Skowronek. “The most critical part of the recovery was the feeding, because if you feed [too much] too fast there is the risk that the food gets stuck at the swollen, and maybe narrowed, part of the resection [just before the suture]. Weeks passed before he was stable enough to leave the clinic, but his challenges weren’t over. Turnout wasn’t an option, so Zaranza walked in hand twice a day to help regain his strength. But he developed an abdominal hernia, so he returned to the clinic, where he remained through Christmas. “This is the main risk after a second abdominal surgery because the big muscles and the suture of the abdomen get weaker and can’t bear the weight of the heavy intestines like before,” said Skowronek. But the girth wasn’t enough. An additional three meters of small intestine became trapped in the abdominal hernia, and Zaranza started to colic again. Zaranza was cleared to return to light work in December of 2016. He began with brief periods of trot, and as time went on the length of his workouts increased. Schröder started cantering him and slowly added small jumps to their routine. In March 2017, Zaranza got back into the swing of things at the Mediterranean Equestrian Tour in Spain. Within a year, he’d recovered enough to contest five-star competitions, and in 2018, they picked up 11 top-10 placings in FEI competition. Now 15, the stallion appears to be in the best form of his life. But for Schröder, he’s just happy to have Zaranza back. Do you know a horse who returned to the competition ring after what could have been a career-ending injury or illness? Email Kimberly at kloushin@coth.com with their story.